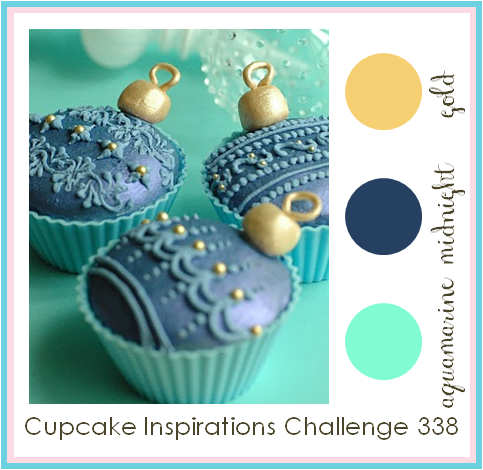 Here is another Cupcake Inspirations Challenge for you! This week's sponsor is All Dressed Up Stamps. 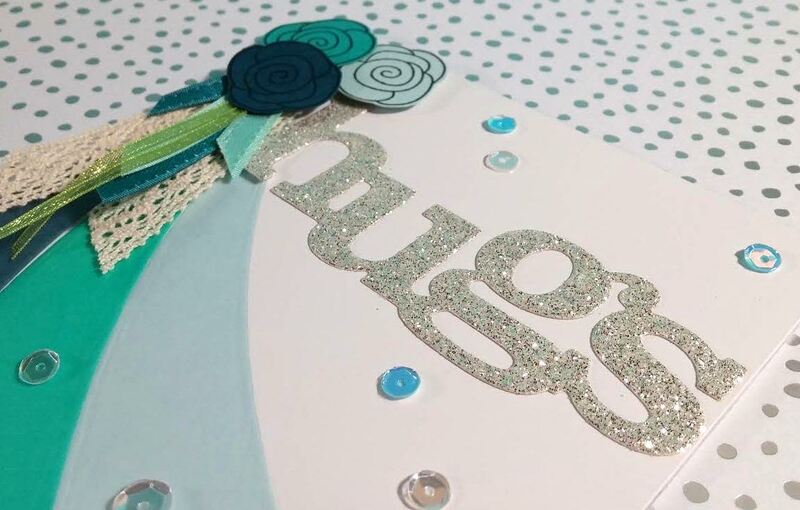 Aren't these colors oh so pretty!? 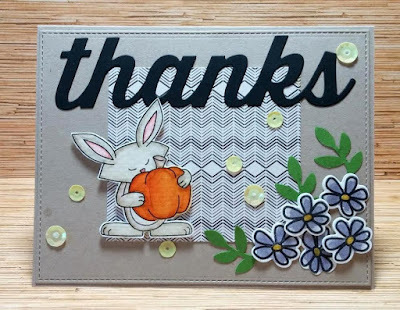 The sponsor generously provided us some cute digi images to work with, thank you! My pick was this adorable fairy! My bestie in Japan asked me what I wanted for my birthday, so I requested Copic markers (I figured they're more reasonable there) and they just came! Her dress and headband were colored with one of them...LOVE! Don't forget to check out what the other girls have made over at the Cupcake Inspirations Challenge Blog! Hope you all are enjoying the big meal, and the quality time with your family and friends today! 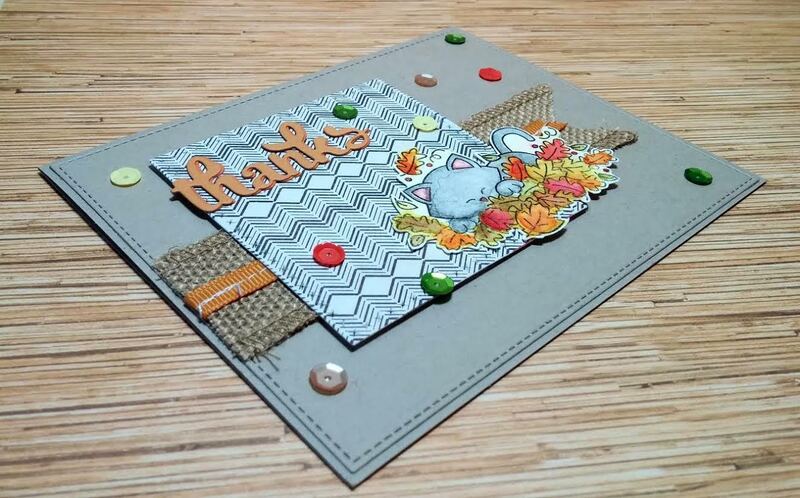 I wanted to make a quick stop to share this card I made for the Inky Paws Challenge over at Newton's Nook Designs! This is more sparkly in person! 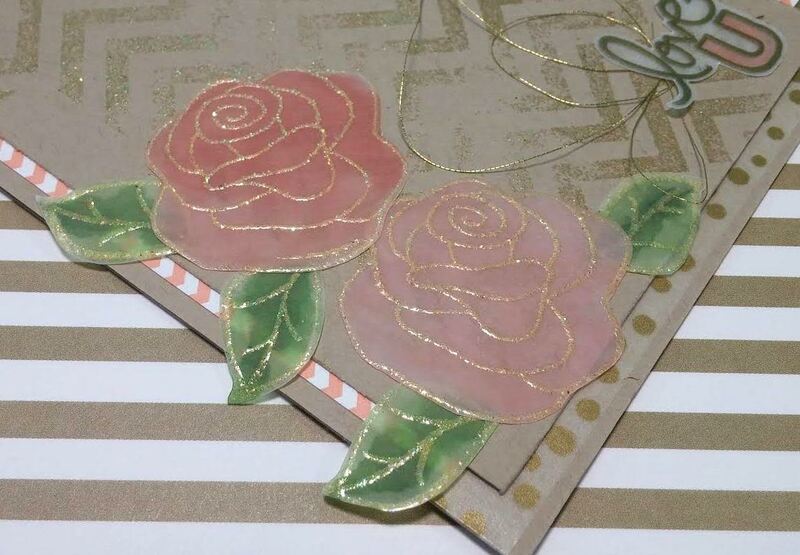 These gorgeous roses were heat embossed with very sparkly gold on vellum, then water colored on the back. Aren't they just so delicate and beautiful!? 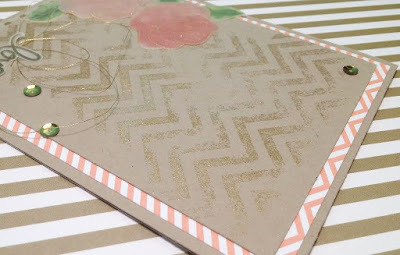 I lightly applied versamark on my Chevron Background stamp to get the distressed look, then heat embossed with the same sparkly gold. I also sanded the edges of the Crumb Cake cardstock for more distressed effect. 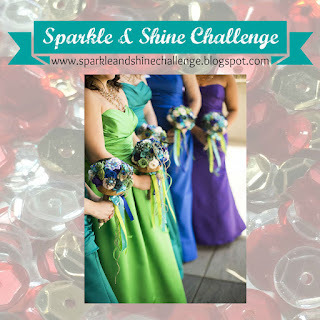 Today I am playing along with the Sparkle and Shine Challenge! I had been dying to play with this stamp set from Newton's Nook Designs that was exclusively made for Stamp-tember over at Simon Says Stamp! 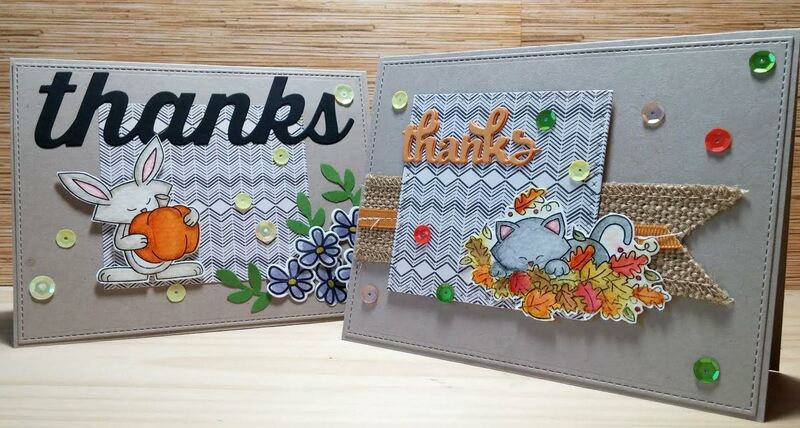 I inked up the cute kitty and bunny for one card, but I couldn't fit them nicely on one so ended up making 2 fall cards! The black chevron pillow in the inspirational photo totally caught my eye, along with the beautiful fall colors! 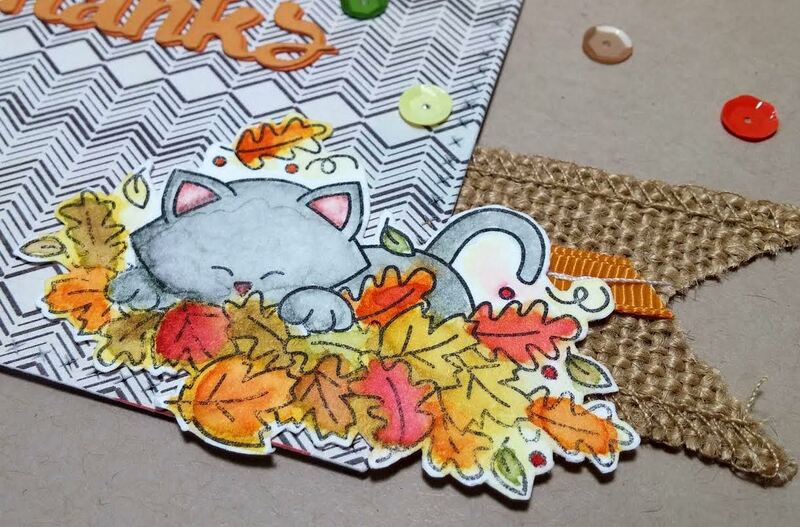 Newton and the pile of leaves were water colored. Burlap and some colorful sequins completed this simple card! 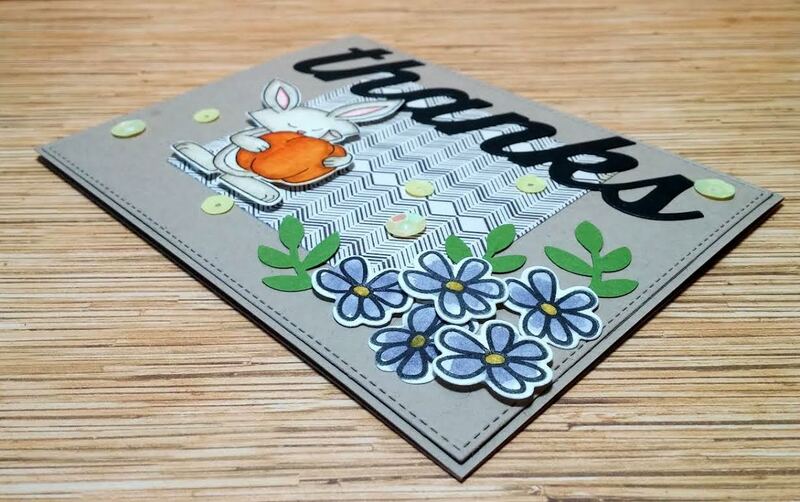 Here is card #2 with this cute bunny! 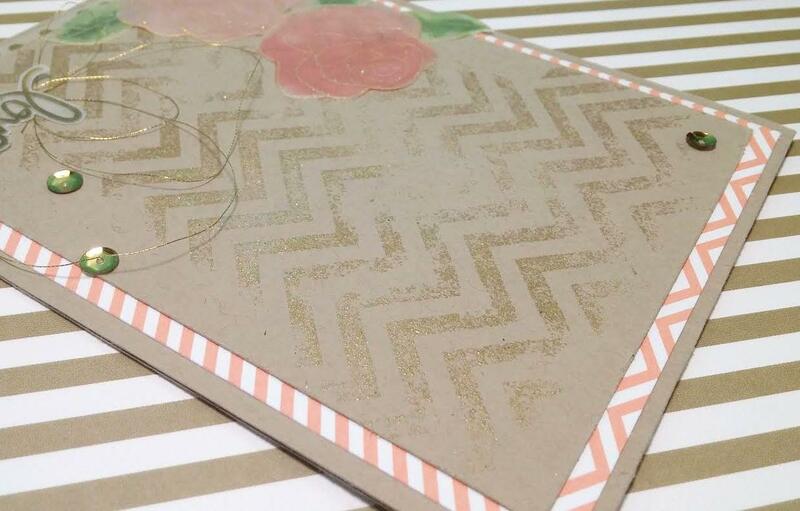 I used the same chevron paper but positioned this one in the center. 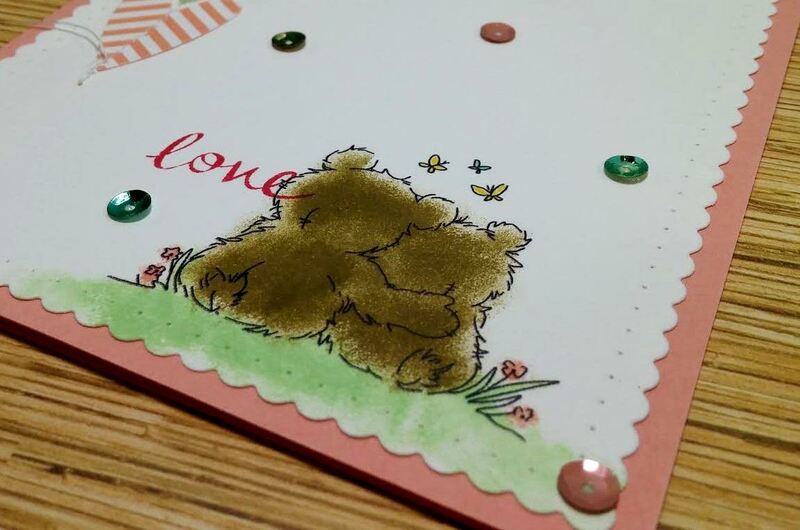 Of course he was water colored as well. The pumpkin was colored with 2 shades of orange to give some depth. 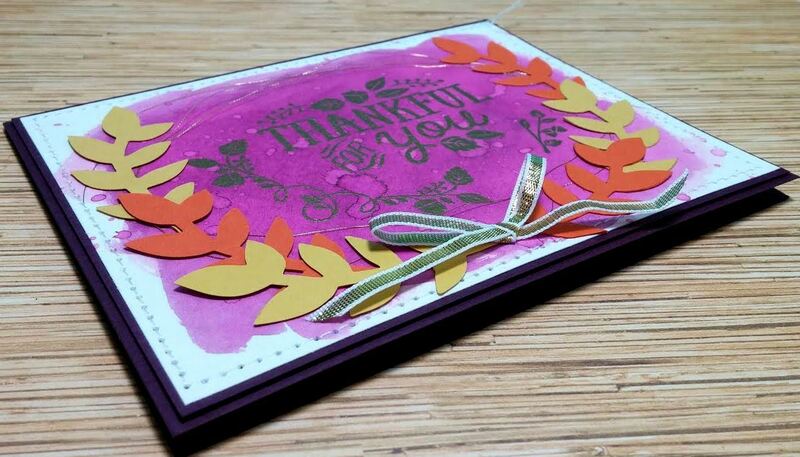 I originally had the same sentiment as the other card but switched to this huge one in black. Just like the rocking chair in the inspirational photo, bold black really pops in light neutral colors! Do you see the purple flowers in the photo? I don't know the name but I have them in my flower garden and love them! So that is what I added. 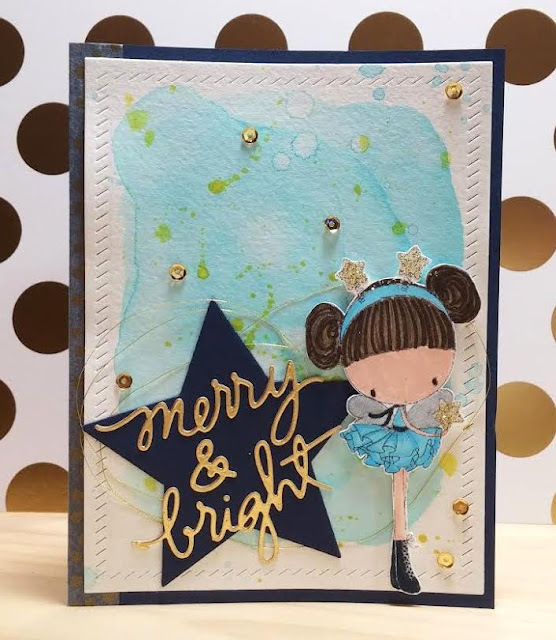 Some yellow sequins were just the right finishing touch, don't you agree!? 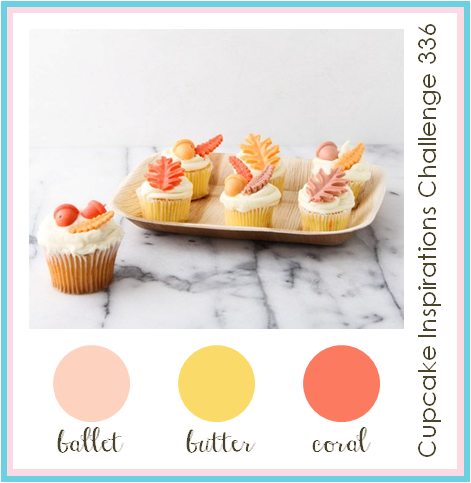 Here goes another Cupcake Inspirations Challenge for you! 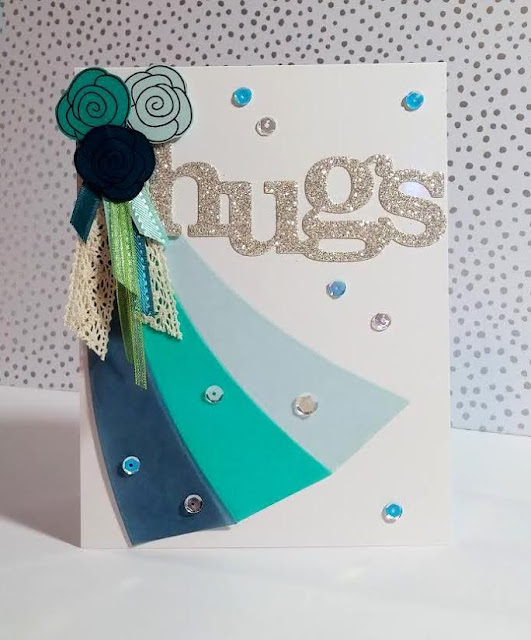 This week's sponsor is Crafty Sentiments. 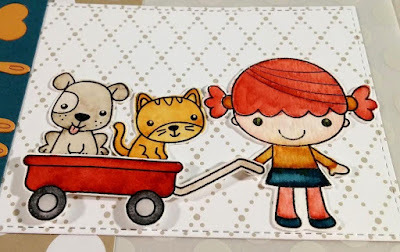 Now how cute and fun is this!? I went very simple to showcase this super sweet image that the sponsor provided us! Seriously, isn't this the sweetest thing ever!? 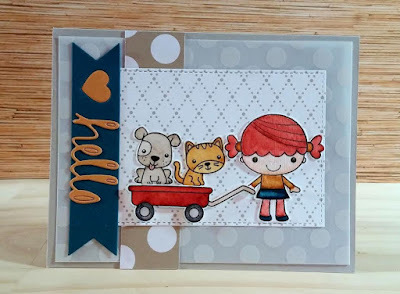 I sponged to color this adorable couple, I just love it! I stitched these heart on my sweet scallop base. Sprinkled some sequins and that is all it needed! I love this retired SU In-Color 2013-2015, such sweet colors! 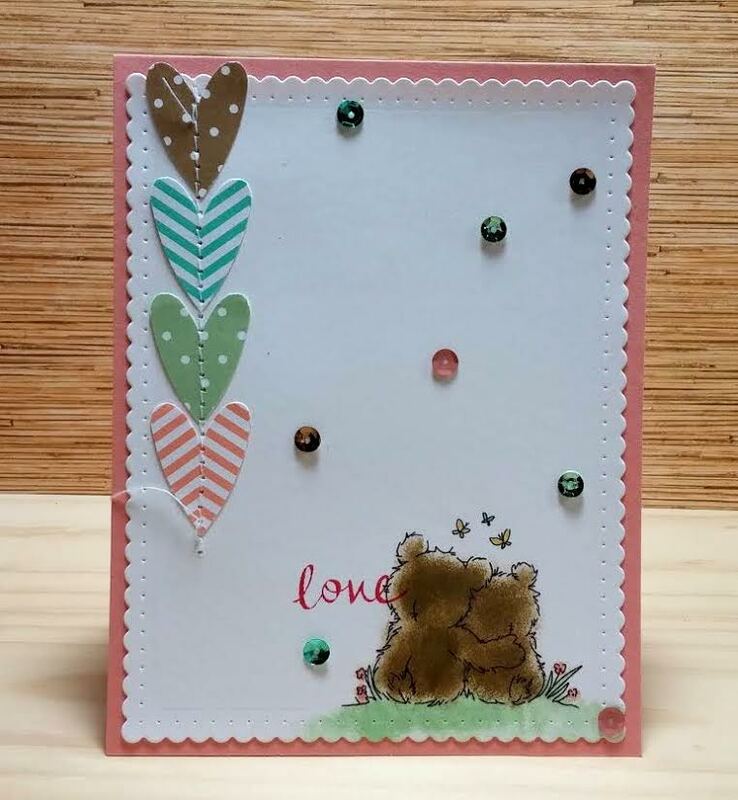 Now let's all go to the Cupcake Inspirations Challenge Blog and enjoy the beary beautiful cards that my teammates have made! 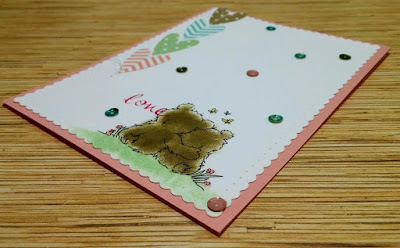 I have a card I made for the Sketch For You To Try Challenge over at Reverse Confetti today! 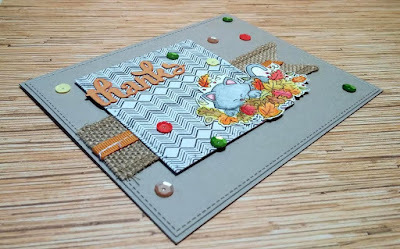 This card took me a few days to complete, I kind of lost my inspirations in the middle of it! Does that ever happen to you? How do you recover? 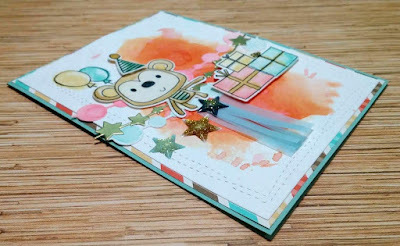 I LOVE this cute little monkey! So stinkin' cute!!! 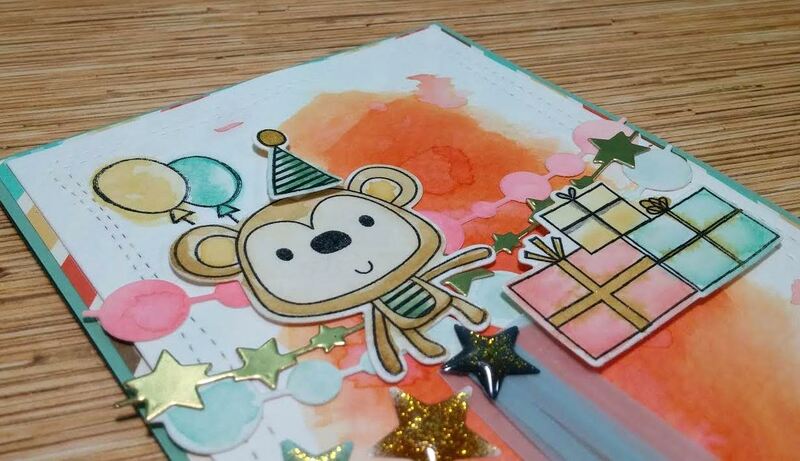 So the whole thing started with my monkey and the presents. I stamped them with Stazon then water colored. I then die cut my garlands, I absolutely adore these dies! 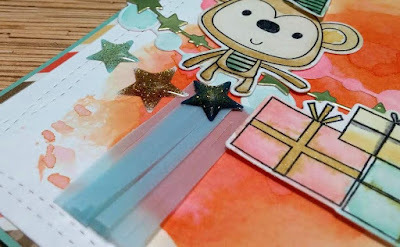 And there was some more water coloring on the garlands and background. 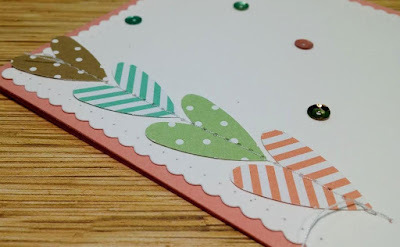 I tried a few different things for the flag part, but settled with this vellum fringe! Those fun, sparkly glitter stars were added to repeat the star garland. 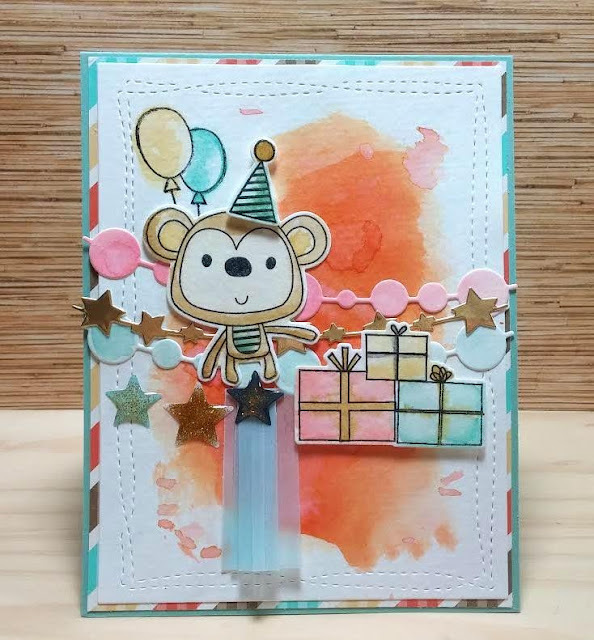 After assembling the party together, I layered it on this patterned paper, I happened to use all the colors on this one! Even thought I got lost in the middle of this card, I think it turned out cute... What do you think? 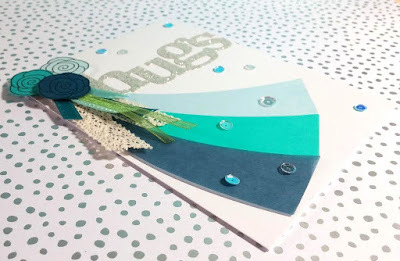 This week's sponsor is Deedees Digis! 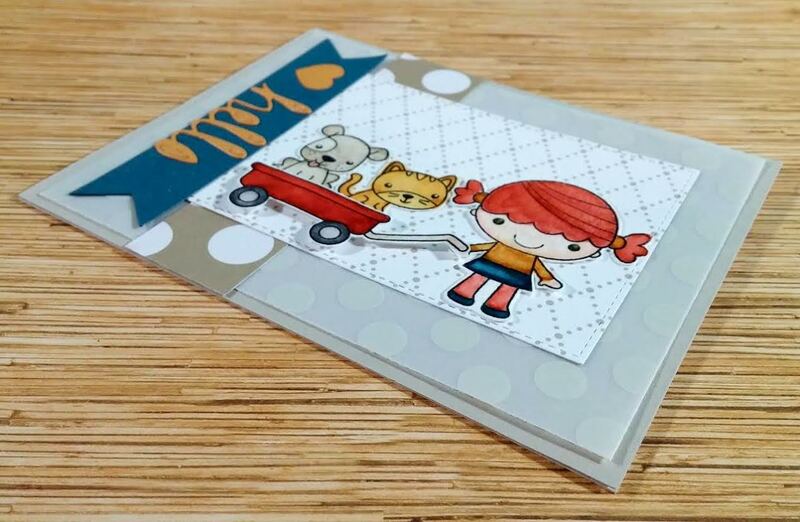 They have so many cute images, it's worth a little trip to their store! 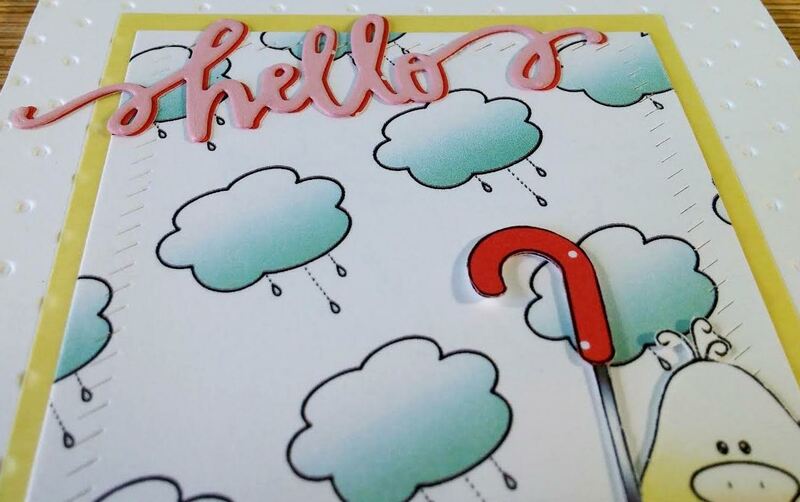 Aren't these colors just so yummy!? The sponsor generously provided us digi images to work with, thank you! I picked this super adorable ducky! 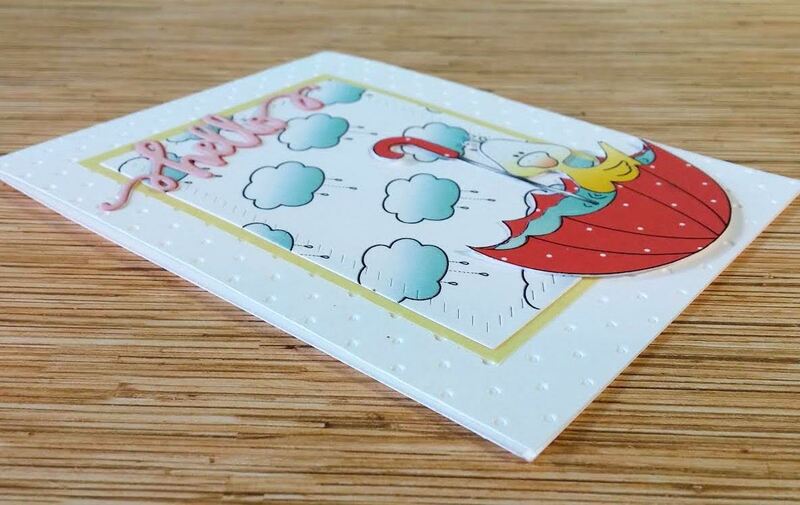 So what's really cool about their digital stamps is, they give you so many images! 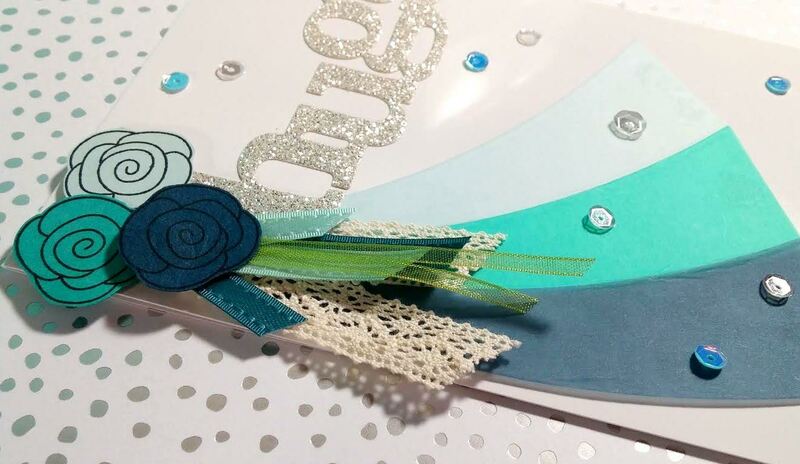 They even give you a set of colored images, a set of outlines, and even printable patterned paper! Isn't he just so cute!? and colored so perfectly! I printed one of the patterned paper also! It's cute, and the colors match so how could I not!? I die cut the sentiment in the same coral patterned paper as the umbrella, then another one in Blushing Bride, and mounted them on top slightly off centered. 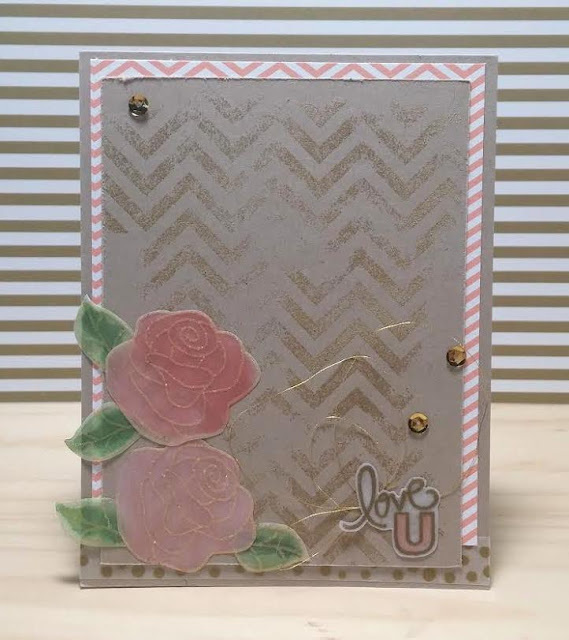 I wanted to keep it simple to showcase the cute image and patterned paper. 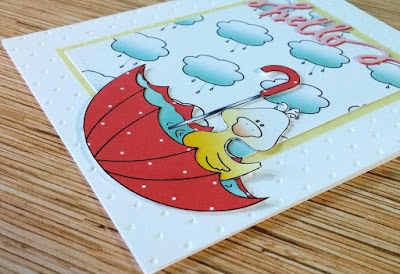 I dry embossed my base card with polka dots, and added yellow vellum, that's all this card needed! I think it turned out so cute! 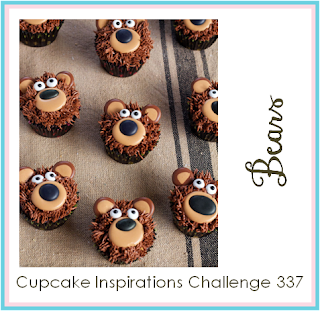 Don't forget to go to the Cupcake Inspirations Challenge Blog to see what the rest of the design team made! I am playing along with the Mixed Media Card Challenge today! The first thing that came to my head was "family tree", so that is exactly what I made! 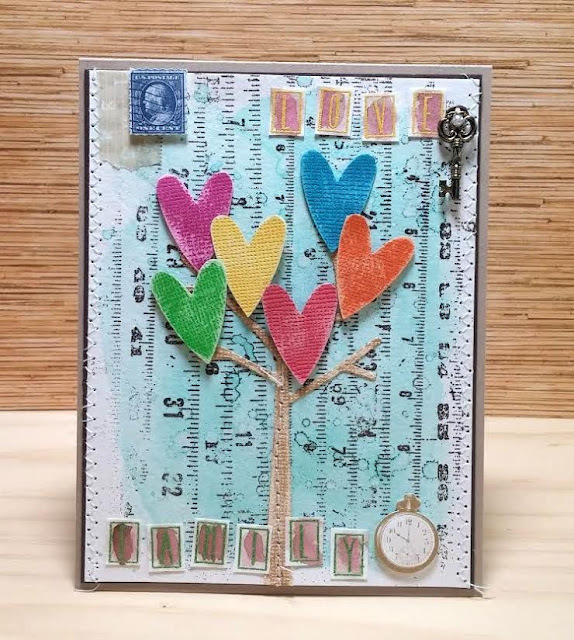 I made my tree with the Core'dination Core Color Cardstock. 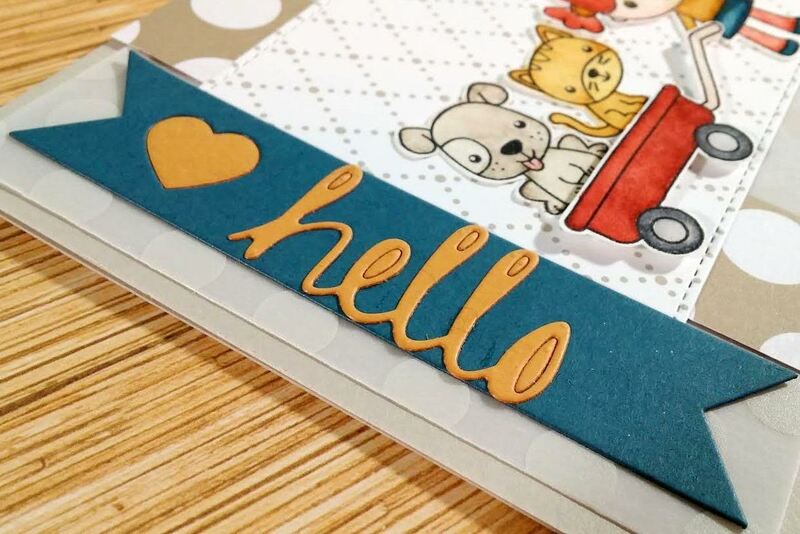 This was my very first time using them, and oh my! 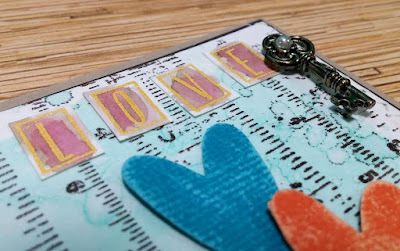 I am loving the distressed look you can make so very easily! 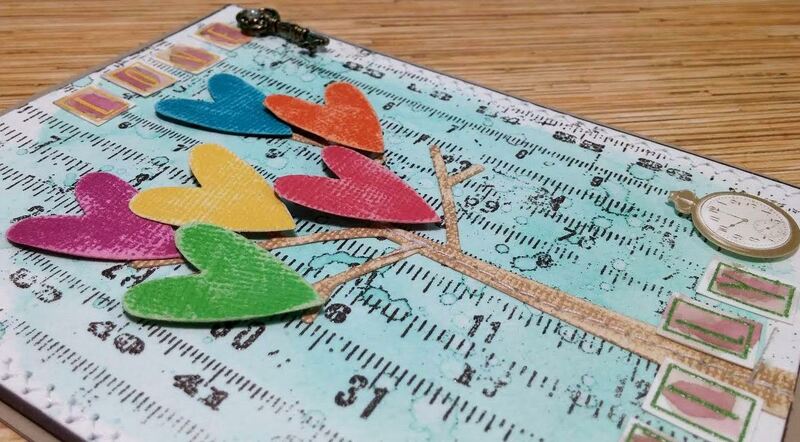 Each heart on the tree represents my family member, my very handsome husband, our 4 beautiful children, and myself. Of course I had to water color my background, I am totally addicted! 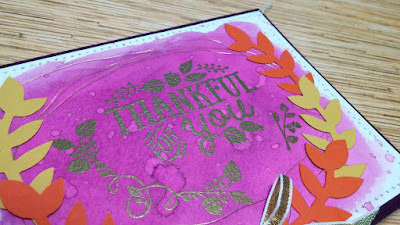 I water colored it with Coastal Cabana, stamped the measuring tape background stamp lightly with Versamark then heat embossed with the Early Espresso emboss powder. 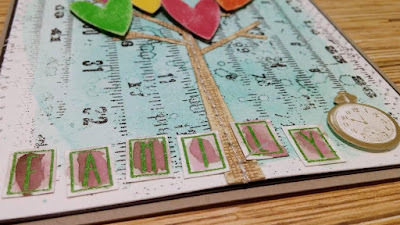 I heat embossed "family" and "love" with this little alphabet stamp set from Target's $1 shelf, cut them around the rectangles, water colored with Early Espresso. 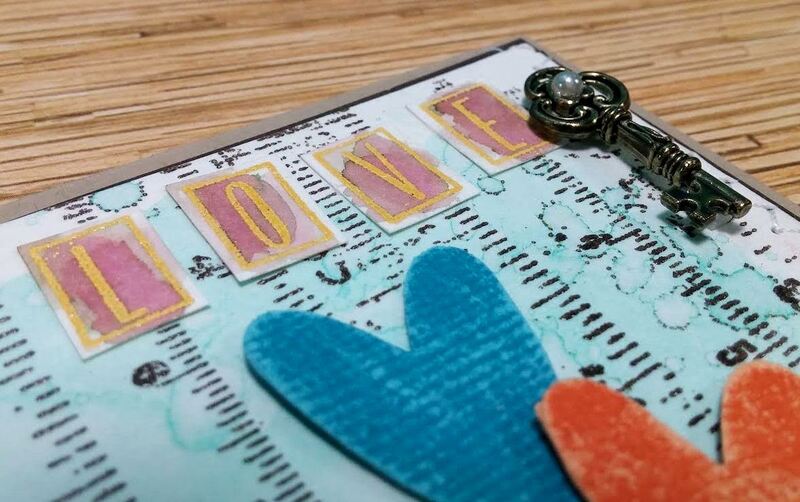 Those little pocket watch die cut and key trinket are from Japan. 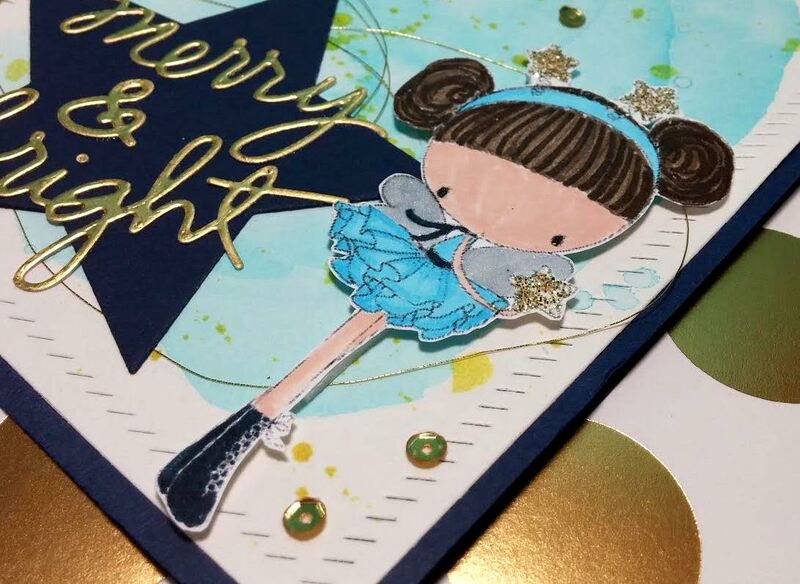 My sister sent me some washi tape and stickers a few years back, and now that I've met mixed media, they make the perfect embellishments! 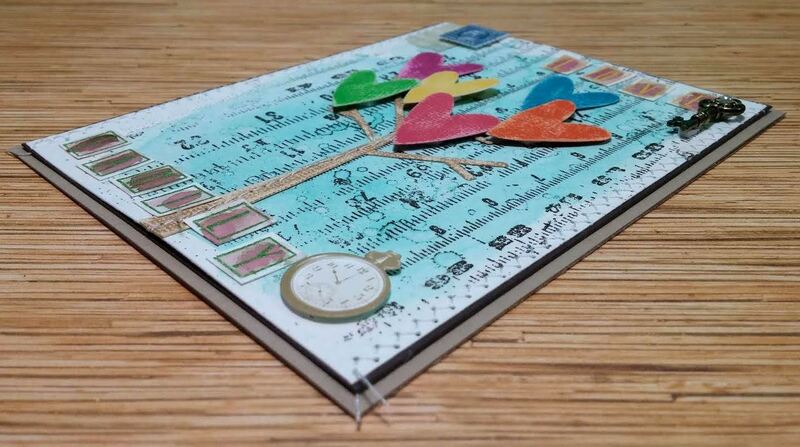 I cannot get enough of mixed media, it tickles my arty side! Today I am playing along with the Pals Paper Art Challenge! Well, isn't this a beautiful fall color combo!? Even though you're not required to use Stampin' Up! products to play this challenge, I feel like I should only use SU since I am one of the pretty pals (SU demo group). So this card is all SU! I've been playing with more non SU products this year, so this was refreshing! 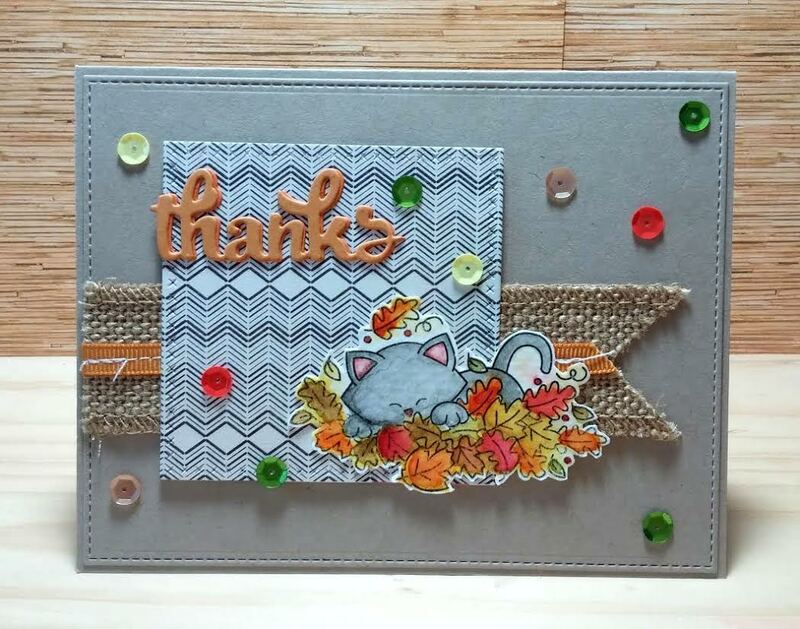 I needed a thank you card, and I just got this Thankful Forest Friends set, perfect! I heat embossed that beautiful sentiment on my water colored background. Well, it was off centered! *Ooops! 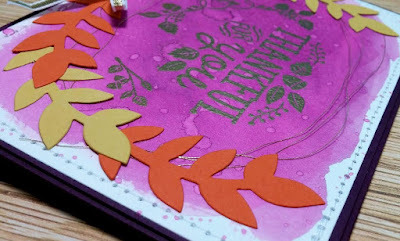 * So I added that pretty vine on the left, and a little branch on the right side of the sentiment to balance. Just added a little gold bow and done! 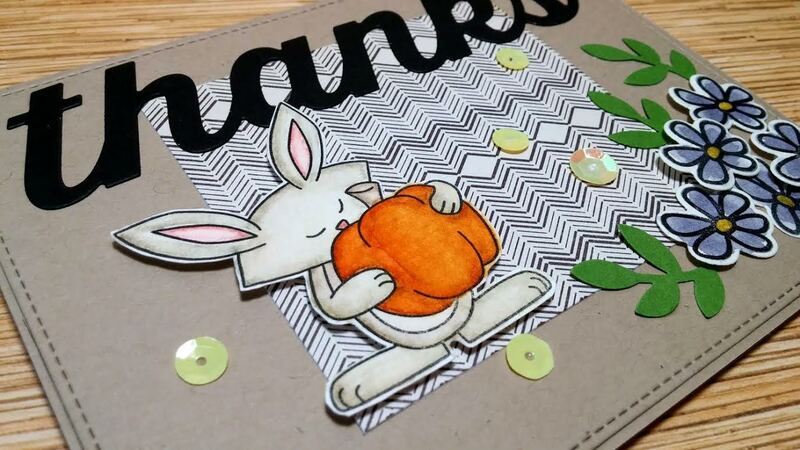 This was pretty quick to make, and I love how it turned out! 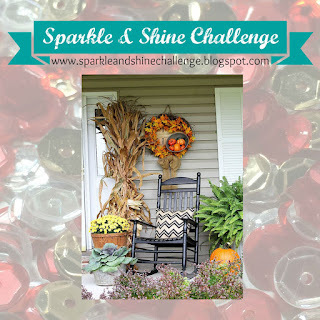 I am playing along with the Sparkle and Shine Challenge today! Those dresses are so silky and beautiful! 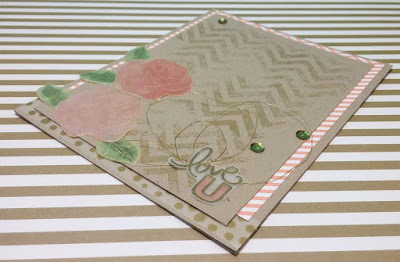 I thought I had the In a Word: Love Cutaway, but apparently I don't...does that ever happen to you!? 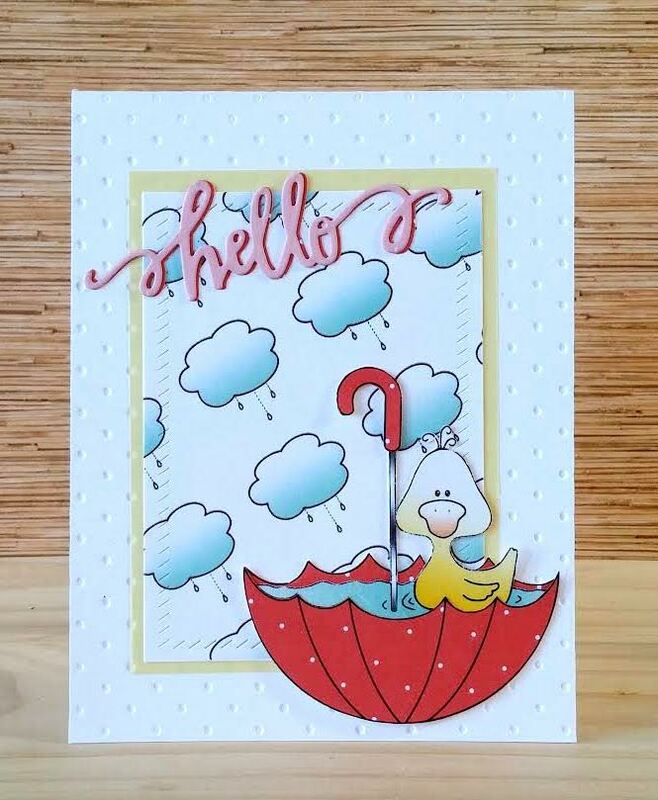 Well, I think this sentiment works beautifully too! 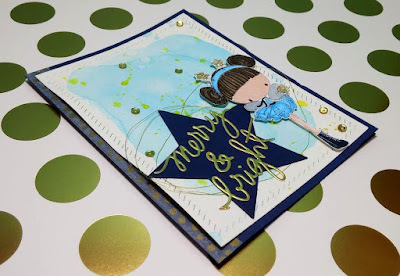 I think this card is different, but still pretty... I am not sure if that's a good thing or a bad thing... Let me hear what you think! I am playing along with the Your Next Stamp Challenge today! 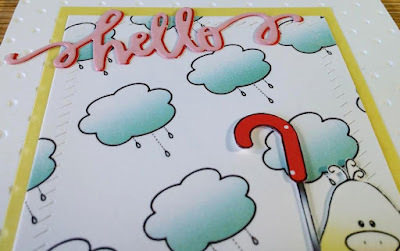 If you're sweet enough to follow my blog (thank you so very much, by the way! 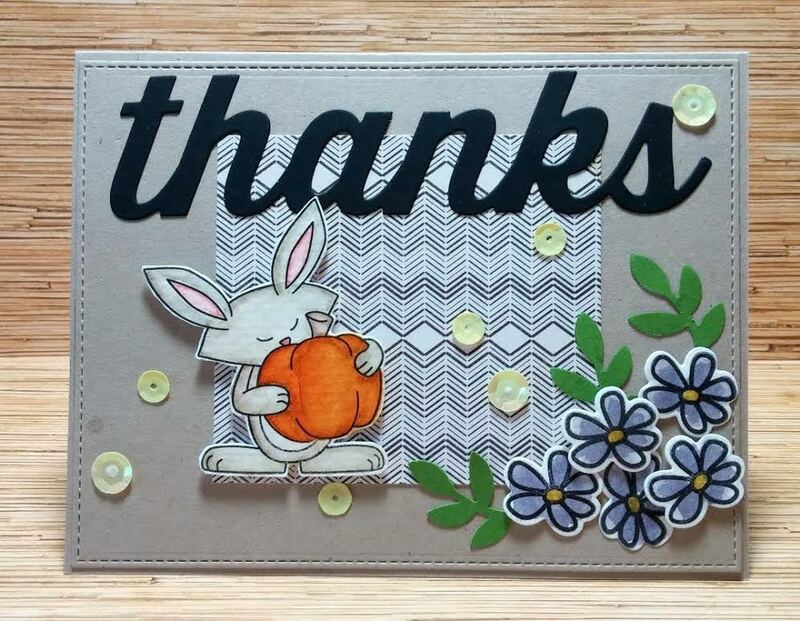 I know my style has changed so much, but I am glad you still enjoy my creations! 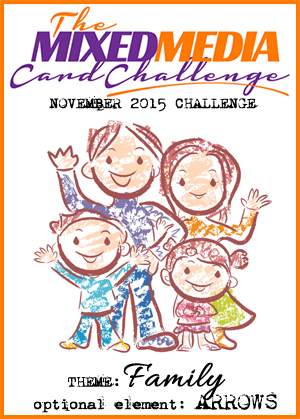 ), then you know that sketch is not my strength, so playing a sketch challenge is fun, but hard! 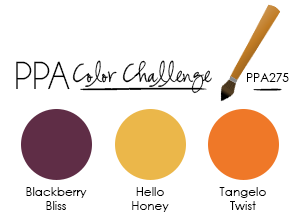 But since I am playing the color challenge also, and these rich, fall colors are absolutely gorgeous, it wasn't that hard! 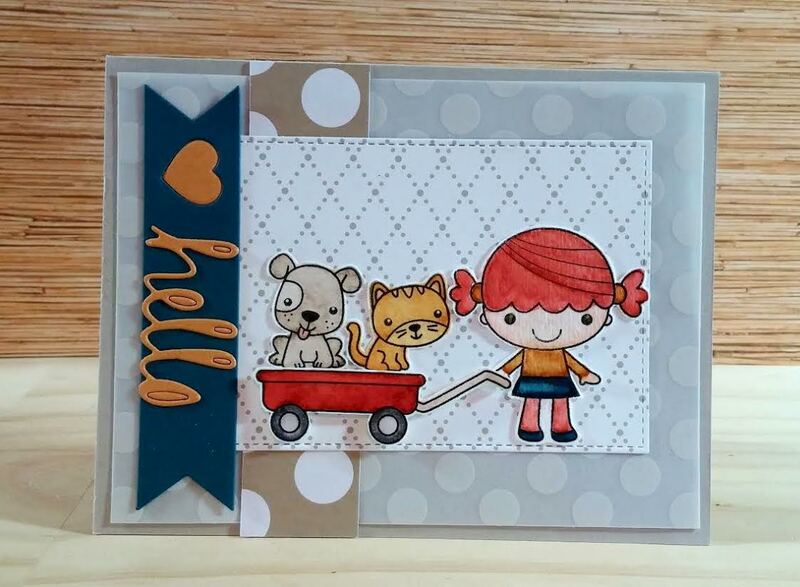 I am totally in love with this adorable stamp set! I used Crumb Cake, More Mustard, Cajun Craze, Not Quite Navy, and Basic Gray to color everything. 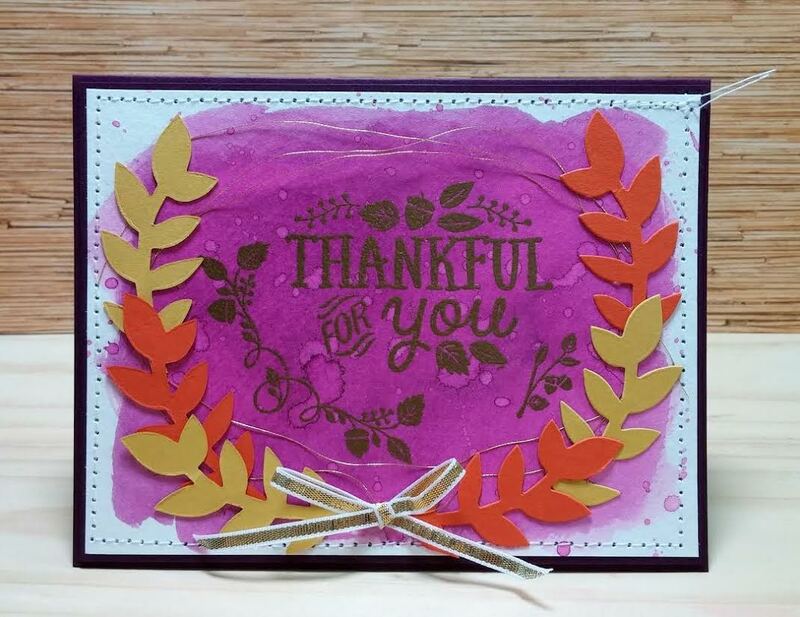 This sentiment is from the Scripty Words Die set, the very first sentiment die set I bought! I used the Sahara Sand cardstock for my base.